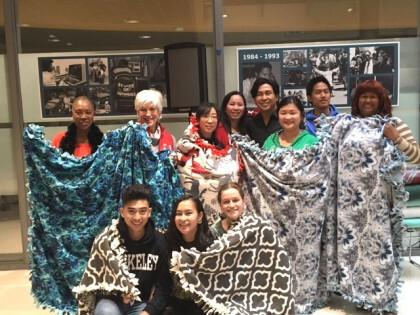 Thanks to a donation from Rotary of Berkeley, students and faculty at Berkeley City College were able to make 12 blankets this semester that will help keep those in need warm this winter. It is certainly the best time of the year, especially for our community colleges, Laney and Merritt colleges, College of Alameda and Berkeley City College. Finals are being completed and students and faculty are ready to spend the winter break celebrating the holidays with family and friends. As the semester winds to an end, the spirit of giving was clearly evident at the Peralta Colleges this December. Remember, if you have a story idea for the column, please write me at jheyman@peralta.edu. Have a wonderful winter break and thank you for everything you do for our students.